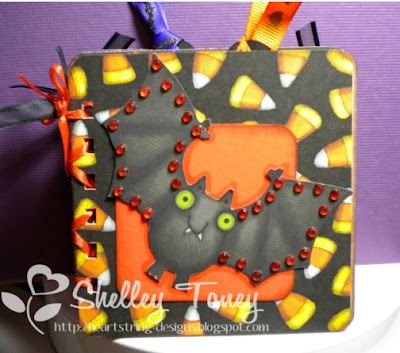 Shelley Bean: Halloween Album #2--Blank Coasters and the I-ROCK! 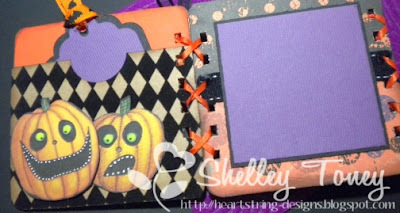 Halloween Album #2--Blank Coasters and the I-ROCK! How is your weekend going? I am so happy mine is here! I had quite a stressful week and so it was really nice to sit in my craftroom a little today and create this very special post I wanted to share with you. Yesterday I shared a fun accordian album I learned how to make. But, that is not the only trick I have up my sleeve...in fact you could even call this a treat! (get it...trick..or...treat? teeheehee) Anyway...as promised I have the 2nd tutorial ready to share with you and that utilizes these very handy dandy items called Blank Coasters. You can purchase these at Paper Patch Crafts. I know I sure am going to order some more, because this idea came together pretty easily for me and was not really that involved at all! The coasters measure 4" x 4" so it was really simple to cut my patterned paper out, round off the corners and adhere them to the fronts and backs of the coasters. Just as an FYI, the coasters are a lightweight chipboard. When you start building up the surface with your paper layers they really become a nice heavy weight item that can hold up to all the embellishments you might want to add to your page. Click over to Anne's Website and you can order these for yourself! Here is a little video I made that showcases this fun album, and also demonstrates my new I-Rock tool from Imaginisce. Love it! I hope you will too!! WOW! This is adorable! Love the paper pac you used and all the detail you put into is awesome! Great job! LOVE IT! Very nice for a gift. Cute little album that will make a great gift. Funmare Before Halloween Blog Hop!!! Punky Teens Christmas Release Blog Hop!